Many remain skeptical of the premise simply due to what they assume to be an exceptionally low probability that such creatures could remain undetected and unacknowledged today by modern science, especially within the continental United States. It has been pointed out that there is no history of known hominoids in North America. Indeed the original primates to have ever inhabited North America were squirrel-sized to cat-sized Eocene prosimian primates, most closely related to modern lemurs and lorises, not apes or hominins. South and Central America would subsequently be colonized by platyrrhine primates, a diverse radiation now represented by marmosets to spider monkeys. Where are any recent physical remains? The same factors discussed in connection with the scarcity of fossil remains apply to the accumulation of neontological skeletal remains. The wet coniferous forest thought to be their core habitats are notoriously poor preservers of bone (Fig.1). Acidic conditions and the action of gnawers make quick work of fresh skeletons. Consider also that a large-bodied, long-lived, slow-reproducing hominoid would have low population densities and low rates of mortality. In my home state of Idaho, I would infer a potential population of sasquatch numbering about 150. Compare this to the 20,000 resident black bear in the state, with an average life span of 10 years. How often are skeletal remains of black bear that have died a natural death discovered? Such remains are almost never found. The odds of finding sasquatch remains could be at least 600 times less, all else being equal. How would a relict hominoid make a living in a temperate forest habitat? The often repeated generalization that primates are strictly tropical-adapted mammals is simply inaccurate. Fossil Miocene apes occupied a temperate Europe dominated by deciduous forests. Living mountain gorillas inhabit elevations in the Virunga Mountains with nearly freezing temperatures. Monkey species in Nepal, China, and Japan endure frigid winters at high elevations and high latitudes. The productive wet temperate coniferous forests of North America provide ample resources for an omnivorous mammal (Fig.1). Some have contested that there already is a large omnivore in the temperate forests of North America, the bear – as though a Single Species Hypothesis applies to the large omnivore niche. Omnivory is a broad niche categorization and it can be partitioned in any number of ways. Bears have evolved from a carnivore ancestor and have subsequently modified the carnassial teeth and somewhat elongated the short carnivore gut, but lack a caecum and can only poorly digest plant structural parts. Sasquatch would conceivably represent a hominoid derived from a folivore/frugivore ancestor, emphasizing a flat face with deep jaws, which almost certainly support an enlarged and thick-enameled post-canine dentition. It would have the teeth and jaws of a Cuisinart. Combined with a capacious gut, slow passage time, and likely hindgut fermentation (perhaps even employing coprophagy, as practiced by some great apes) to digest a much wider selection of foods than those available to bears. One study attributed 30 plant species to the black bears diet. By comparison, the orangutans’ diet includes over 400 plant species. Bears employ a form of hibernation as needed to bide the winter months. Whether sasquatch hibernate, migrate, store food, or have sufficient masticatory and digestive attributes to get through the winter, remain unanswered questions, but any of these options are quite reasonable behavioral hypotheses for a large bipedal hominoid. Figure 1. 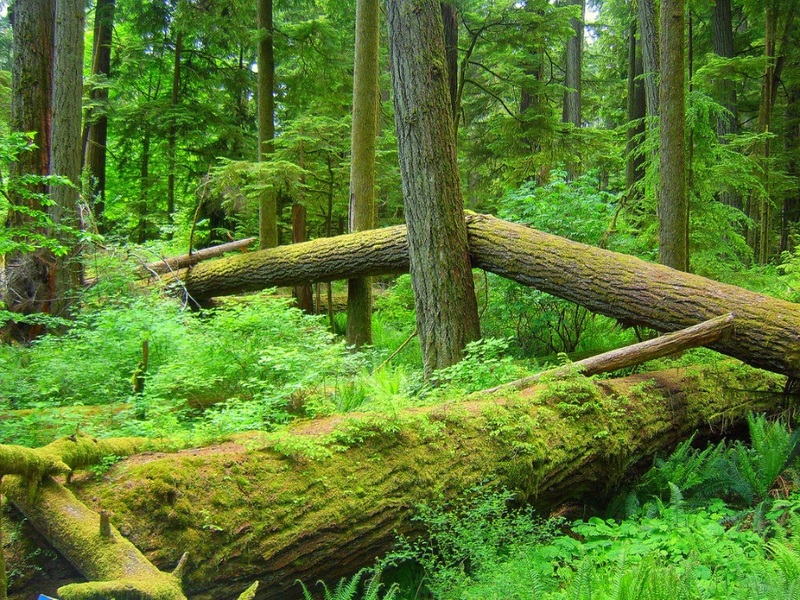 Example of Douglas fir/huckleberry (Pseudotsuga menziesii/Vaccinium globulare) forest type in the Pacific Northwest that likely represents a core habitat for a large omnivorous relict hominoid (Image credit: Jeff Meldrum). The preceding contentions, often raised in a knee jerk fashion, reflect concerns over the probability of extant relict hominoids. These disputations taken singly, or even collectively, certainly do not falsify the hypothesis a priori. Rather than limiting the discussion to apologetics for the absence of some evidence, we would do well to consider and account for the accumulating evidence in hand and consider objectively its implications for the presence of relict hominoids. What is the substance available that lends weight to the probable existence of a relict hominoid in North America and Asia? 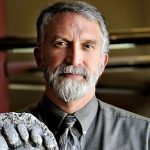 Given my research expertise into the evolution of hominin locomotion, especially the adaptations of the bipedal foot and footprints my attentions have focused on the trace evidence of footprints and trackways, for sasquatch in particular, but also other potential relict hominoids around the world, e.g. yeren, almas, and orang pendek . The footprints constitute a prolific body of data that permits repeatable objective evaluation. They, the footprints, exist. I have amassed over 300 specimens of footprint casts, as well as hundreds more photographs of footprints. The analyses of these have been the subject of a number of publications, as well as public and professional presentations. 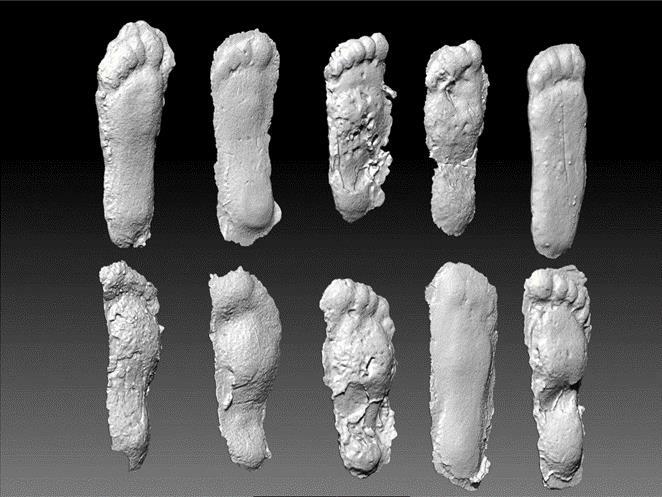 I am in the process of archiving these data in digital form, as 3D scan files in the case of the casts, making these data available to any interested investigator (http://specimens.iri.isu.edu/footprints/). It would seem to have been a reasonably straightforward proposition to evaluate this trace evidence as it came on the public scene over half a century ago. But as revealed by the discovery and excavation of the 3.6 million year old fossilized Laetoli hominin footprints in the late 1970s, the earliest trace evidence of hominin bipedalism, there was a dearth of comparative data and acumen within anthropological circles for interpreting hominoid footprints. Although advances have been made since then, reflected in a growing literature and a new generation of anthropologists and ichnologists specialized in this area of research, the implications of the sasquatch footprint evidence have remained largely un-appreciated or under-appreciated, in spite of the affirmative evaluations offered by scholars such as Napier (1973　), Krantz (1992　) and Meldrum (2006　). Curiously, this reticence is often not the case when I interact with clinical practitioners, e.g. podiatrists and orthopedists, as when I made an invited presentation at the Massachusetts General Hospital in 2012. They evaluated the footprints on their face, without bias introduced by anthropological paradigm or preconception. Likewise, forensic investigators and wildlife trackers are frequently more open-minded on the subject and historically more appreciative of the relevance of the footprint evidence, than the anthropological community at large. One of the best documented and thoroughly examined trackways attributed to sasquatch is that associated with the controversial Patterson-Gimlin film, taken at Bluff Creek in northern California on October 20th, 1967. The 60 second film clip continues to evoke discussion and debate as to its authenticity and ramifications, but has withstood concerted and repeated efforts to convincingly falsify it. The associated footprints were examined, filmed, photographed and cast by multiple witnesses. The pair of 38 cm casts made promptly by the primary witnesses form the basis of the ichnotaxon, Anthropoidipes ameriborealis MELDRUM 2007, namely the “North American ape foot.” Ichnotaxonomy is the formal classification of tracks and traces, generally of as yet unknown extinct animals. In this instance the trackmaker is unknown, i.e. unrecognized or unacknowledged, but not extinct. The nomen applies to the tracks, not the trackmaker, and a description and diagnosis establishes the distinctions of these tracks from those of other species, principally humans . One particular footprint in the trackway at the Patterson-Gimlin film site, photographed by then USFS timber cruiser Lyle Laverty, and subsequently cast by investigator Bob Titmus, has proven to be pivotal in interpreting the distinctions in morphology of the sasquatch foot, and central to its diagnosis. This footprint captured the dynamic trace of a flat flexible bipedal foot resulting, in this instance, in a distinct midfoot (or: midtarsal) pressure ridge (Fig. 2). Figure 2. Photograph taken by Lyle Laverty at the Bluff Creek, California site of the Patterson-Gimlin film of a 37 cm footprint displaying a pronounced midtarsal pressure ridge (arrow). Inset illustrates a series of stills of a 3D scan of a cast made by Bob Titmus of the accompanying footprint (Image credit: Lyle Laverty and Jeff Meldrum [insert]). Some have challenged, why only one footprint in the Bluff Creek film site trackway would exhibit this feature, if it were the result of a distinguishing morphology. They contend that this is merely a singular artifact and not a reasonable basis for a model of foot form and function. 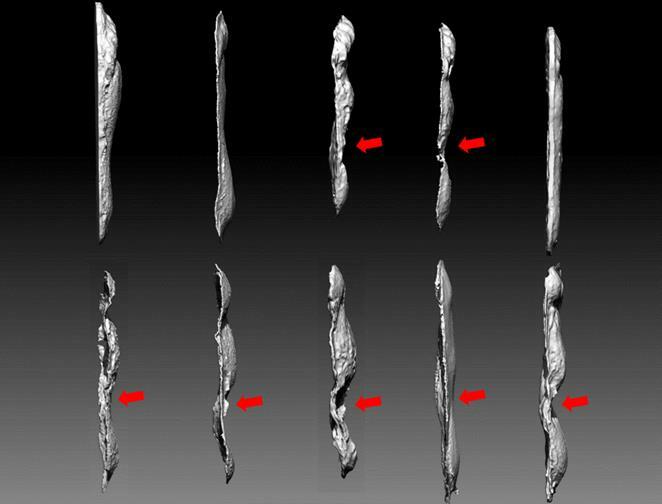 In fact, most of the casts made by Titmus show evidence of a midfoot pressure ridge to varying degree, as can be seen when the casts are viewed on edge (Fig. 3). Figure 3. Scans of the ten original casts made by Bob Titmus nine days after the filming at the Patterson-Gimlin film site, constituting additional material relevant to the holotype of Anthropoidipes ameriborealis. Seen in ¾ view (top) and on edge (below), with arrows indicating the midfoot pressure ridges (Image credit: Jeff Meldrum). As noted previously, I had occasion to personally examine a line of very fresh 38 cm hominoid tracks in the foothills of the Blue Mountains outside Walla Walla, Washington, in 1996 . Several of these footprints also clearly exhibited evidence of midfoot flexibility, producing either distinct pressure ridges bearing remarkable resemblance to the Titmus cast from the Patterson-Gimlin film site. The implications of this correlation, corroborated through numerous additional documented footprint examples, provided insight into the functional morphology of the sasquatch foot . What can we learn about sasquatch by a detailed analysis of its footprints? Sasquatch footprints indicate that its foot is not merely an enlarged facsimile of a human foot. The human foot is generally characterized by a relatively rigid longitudinal arch, produces the characteristic “waisted” appearance of its footprint. This arch is a fairly recent evolutionary innovation associated with the gracilization of the human skeleton and adaptations for endurance walking and running in Homo sapiens, or its immediate antecedents . It derives from a primitive foot pattern marked by a greater range of flexion and rotation at the midfoot. This mobility, combined with a divergent big toe is integral to the ape’s grasp-climbing adaptation, in which the prehensile vs propulsive functions of the foot are coordinated. When climbing, or walking on the ground, this flexion of the ape’s midfoot is called the “midtarsal break.” This denotes a “break” in the sense of flexion about an axis of rotation, not as some form of damage or dysfunction. On the contrary, the agility and gymnastics of chimpanzees and gorillas are impressive to say the least. In the case of the sasquatch, this inferred flat flexible foot morphology provides a biomechanically sound and effective adaptation for a massive terrestrial bipedal primate to negotiate steep uneven terrain in mountainous forest habitats. In contrast, the human foot has evolved along a very different path – one that took our recent ancestors into more open flat terrain, where distance running and walking were the activities selecting for a lighter skeleton and a more rigid foot platform. The arched foot and shortened heel of the modern human lend advantage to running behaviors . In contrast, the sasquatch foot avoids a significant consequence of an arched foot – peak plantar pressures beneath heel and ball, instead distributing forces more evenly across the whole plantar surface of the foot. The action of the sasquatch foot itself, as it correlates with these distinctive footprints, is evident and observable in the Patterson-Gimlin film subject (Fig. 4). Elevation of the heel, while flexed at the midfoot, disperses pressure beneath the entire forefoot, sparing relatively longer toes the bending stresses experience by human toes. Under appropriate conditions of gait and substrate, this action may occasionally produce the distinctive pressure ridge evident in the Titmus cast and numerous other examples . The observable subtleties of correlated form and function within a distinct biomechanical context of this film and associated footprints render the cliché adage “Oh, that’s just a man in a fur suit” quite vacuous. Figure 4. The morphology of the sasquatch foot (left), inferred from the Patterson-Gimlin film, to account for the midtarsal pressure ridge evident in the photo and cast in Figure 2, contrasted with that of a modern human foot (right). The pressure ridge results from displacement of plastic substrate from under the forefoot (arrow). 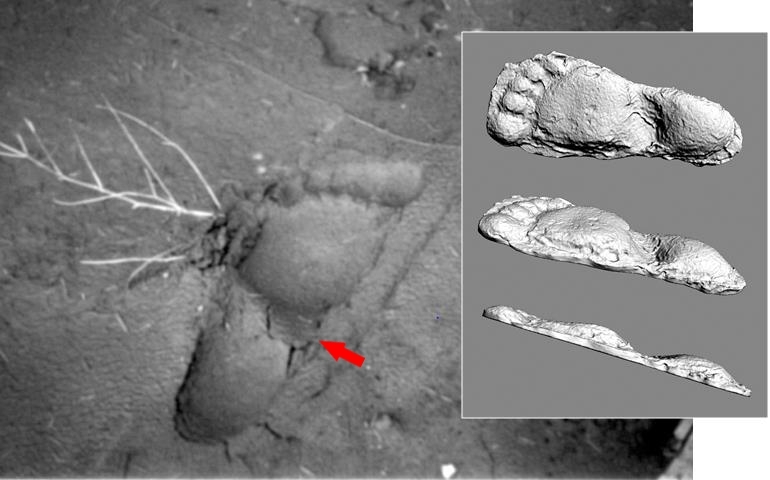 This inferential model of the sasquatch foot form and function received dramatic corroboration during a visit to China’s Shennongjia Nature Reserve, in Hubei province. This reserve comprises more than 3,000 square kilometers and includes the largest expanse of old-growth forest in central China. It was there that in 1995, a park ranger, Mr. Yuan Yuhao, claimed to have witnessed an upright hair-covered hominoid, a yeren (Chinese – wildman) while patrolling within the park . He was climbing a slope near the head of a valley at an elevation of approximately 2,100 m. The site, which I inspected, is a mosaic of fir forest and sedge meadows, not unlike some Rocky Mountain habitats I am so familiar with. Yuan observed the yeren through binoculars at a distance of approximately 500 m. It was covered in reddish brown hair, reclining and sunning itself on the exposed facing slope. When Yuan called out to it, it sat up and turned towards him. Instead of the expected snout and prick ears of a bear, he described a flat face atop broad shoulders. It arose and walked away bipedally into the nearby tree line. Yuan estimated its height at 2.3 m. He subsequently tracked the creature and cast a clear pair of its footprints on the muddy banks of a spring. The casts measure approximately 38 cm in length, 16.5 cm across the forefoot, and 10 cm across the heel. A distinct midtarsal pressure ridge indicates a significant degree of flexibility in the midfoot (Fig. 5, top). Presumably the pair of footprints were left as the yeren squatted beside the spring to drink. This action apparently elevated the hindfoot, concentrating pressure beneath the forefoot distal to the axis of midfoot flexion. The plasticity of the moist bare soil resulted in a distinct midfoot pressure ridge. The deepest points on the cast lie just distal to the pressure ridge, apparently beneath the talonavicular joint medially, and to a lesser degree beneath the cuboid laterally. These two points of plantar pressure lend a distinctive appearance to the proximal edge of the forefoot ahead of the pressure ridge. The margin of the forefoot is marked by a double convexity. 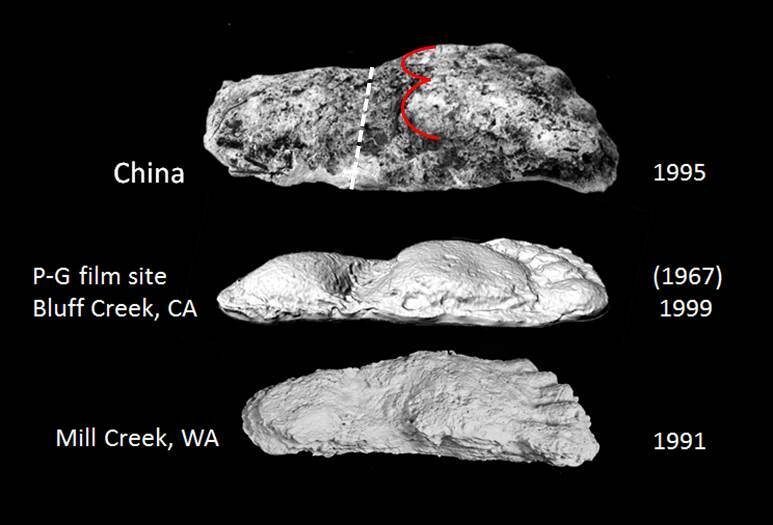 In all distinguishing characteristics the casts resemble those of North American sasquatch footprints, including those recovered at the Patterson-Gimlin film site at Bluff Creek, in northern California. This striking resemblance not only substantiates my model of foot form and function, but indicates a circum-Pacific distribution to this form of relict hominoid, with its likely Asian origin . A further example to demonstrate this remarkable consistency of foot form and function comes again from the Blue Mountains of southeastern Washington State. This example was cast by Paul Freeman, January 14, 1991, along Mill Creek, outside Walla Walla, Washington. The tracks measured nearly 35 cm in length by 13 cm across the ball. The step length ranged from 1.0 to 1.2 m and the trackway was followed for over two miles. Not only does the cast exhibit the distinctive pressure ridge in the appropriate position and orientation, but the distinctive double-convexity at the proximal border of the forefoot, formed by the joints of the transverse tarsal joint is evident as well (Fig. 5, bottom). Figure 5. Independently collected footprint casts exhibiting similar midfoot pressure ridges, both in location and orientation (dashed line). The proximal edge of the deeply impressed forefoot is marked by a double convexity just distal to the ridge (solid line). Note the dates (see text for discussion) (Image credit: Jeff Meldrum). Now here is the remarkable aspect to all this. Although the Titmus cast was gotten in 1967, to my knowledge only a single screened black and white photo of it, depicted amongst a number of other casts in Titmus’ growing collection, was ever published, and that initially in 1973 . In the poor quality photo, the pressure ridge is hardly recognizable. The first replica and analysis of that cast, including the first description of the midfoot pressure ridge, were published by me in 1999, after Titmus’ death . A photo of the footprint itself (Fig. 2) taken by Lyle Laverty, was published in 1978 , but no previous investigator had identified or drawn attention to the midfoot pressure ridge, let alone interpreted or discussed its significance for sasquatch foot function, before 1999. Mr. Yuan had discovered and cast his footprint pair in 1995, also before I have published my analysis. The Mill Creek cast was documented in 1991. To these could be added the tracks I cast near Walla Walla in February 1996 , and numerous additional examples. How could these independent examples, separated by as much as three decades and some a half-a-world apart, coincidently share these sound and significant subtleties of anatomy and functional morphology? Simply a convergent happenstance of unrelated hoaxed footprints? I think not. Another remarkable example of a variation on this theme of midfoot flexibility recently came to my attention. One of the first questions I asked myself when initially undertaking a systematic survey of the footprint evidence was whether there were examples of repeated appearance of particular individuals. It stood to reason that if these creatures were as rare as I suspected, then should tracks be found in a given region over time, the likelihood of them originating from a particular individual should be high. These could be recognized based on size, shape and proportions of the foot, configuration of the toes, and other distinguishing features. Therefore, I was on the lookout for examples of footprints and casts that could be attributed to particular individuals with a degree of confidence. There were two very clear examples of footprints casts from southeastern Washington that at first glance were taken as distinct from one another: one had what seemed to be a somewhat “arched” foot with toes disposed rather squarely across its distal end; the other was quite flat with toes lying along a rather inclined angle. But the feet were otherwise very similar in size and proportion, and details of the toes were particularly comparable, especially the distinctive big toes, which had a characteristic pad shape, among other details. Recalling that the very flexible foot of a chimp, for example, can be flat in one step, but in the next display a transiently raised medial margin of the foot (although not equivalent to a fixed longitudinal arch with its concomitant adaptations of heel and ball), I wondered about this pair. What if, for the sake of argument, I assumed that these casts did come from the same foot and superimposed them with the toes aligned, rather than the casts separately oriented along their generalized long-axes? With the toes lined up, the margins of the forefoot segments likewise came into alignment and the only divergence between the casts was in the respective angles of the heel segments (Fig. 7, right). Movement about the transverse tarsal joint is not just a simple hinge action, but also describes a twisting motion between the fore- and hindfoot segments. It may also involve adjacent joints, such as the subtalar joint, and tarsometarsal joints. This coordinated twisting/flexing action raises the medial border of the foot and increases the angle between the fore- and hindfoot – i.e., supination. Alternately in can flatten the foot and lessen the angle between the fore- and hindfoot – i.e., pronation. These actions are present in the human foot, but to a lesser degree due to the limited range of motion in the joints involved in the relatively fixed longitudinal arch (Fig. 6). Figure 6. 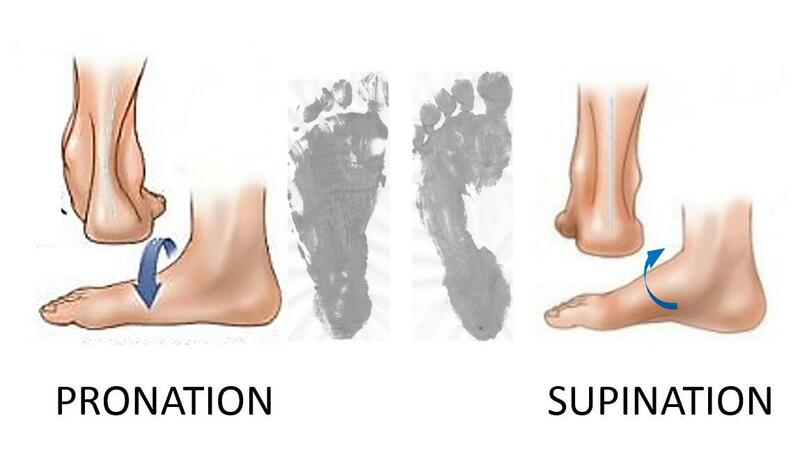 Supination and pronation about the transverse tarsal joint in the human foot. In pronation the arch is lowered (left) and the axes of the forefoot and hindfoot segments are relatively aligned. In supination the arch is raised (right) and the axes of the fore- and hindfoot are relatively angled to one another. The distinct appearance of the resulting footprints are contrasted in the center (Image credit: Jeff Meldrum). The intersection of the long axes of the fore- and hindfoot segments in the representative sasquatch track falls at the inferred relative position of the transverse tarsal joint, in agreement with examples of midtarsal pressure ridges previously discussed (Fig. 7). The two casts in question here were documented independently, by two different investigators, at different locations within the region, separated by nearly two years. What are the odds that such subtleties of footprint anatomy, correlated with intricacies of foot function, could have been so accurately incorporated into these separate and distinct tracks by two independent investigators with no pertinent knowledge or training, let alone the skill to fabricate such a contrasting, yet correlated pair of footprints? Here again this is not an isolated example. Similar instances have been identified, including the contrasting foot postures seen within a single trackway, as is evident in comparisons among the ten casts made at the Patterson-Gimlin film site by Bob Titmus. The cast at upper right in the two series is the most pronated and correspondingly the flattest example from the cast sequence (Fig. 3). Figure 7. Two independently collected footprint casts (38 cm long) from the Walla Walla, Washington region, which are evidently from the same individual. The cast on the left exhibits a position of foot pronation, while that on the right of each frame exhibits foot supination. 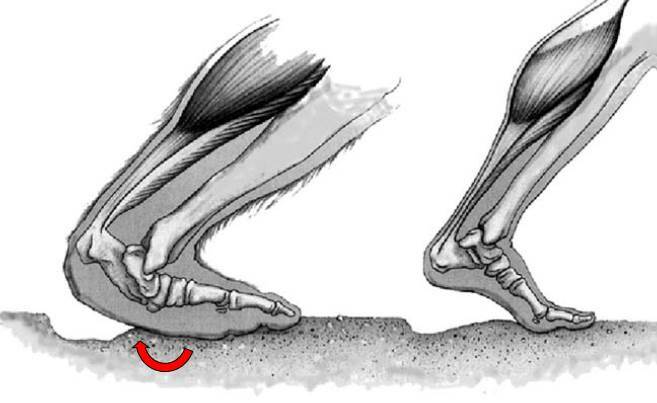 Alignment of the toe row and forefoot contrasts the respective angle of the hindfoot, illustrating the mobility of the transverse tarsal joint, indicated by the arrows (Image credit: Jeff Meldrum). It has been said that perhaps the most convincing test of a hypothesis is the eventual validation of an inference that initially appears at odds with prevailing knowledge. In this vein, I am struck by the numerous examples from the footprint data and the Patterson-Gimlin film, having both received some of the closest scrutiny, that seem to have anticipated by decades current anthropological thinking, but which were rejected at the outset because they were at odds with conventional wisdom of the time. For example, one of the skeptical reactions to the initial viewings of the Patterson-Gimlin film by academia went like this – “From the waist up it looks like an ape, but from the waist down it looks like a hairy human; such a mosaic of traits in nature is inconceivable.” Yet a decade later, with the discovery of more complete skeletal remains of an early australopithecine, Australopithecus afarensis, one could hear the commentary – “From the waist up it looks essentially like a chimpanzee, and from the waist down it looks like a short human; isn’t the mosaicism of evolution fascinating.” Likewise, the combination of a flat face with deep jaws was unknown in the hominin fossil record in 1967 and the biomechanics of the specialized paranthropine face wouldn’t be published until the early 1980s. Only then was the lack of a projecting canine understood to have more to do with chewing mechanics than tool use. A non-divergent hallux was assumed to be correlated with the evolution of the longitudinal arch, not combined with a flat flexible foot. This has remained the case, even for some time after the discovery of examples of early hominin foot skeletons, which, together with the Laetoli hominin footprints themselves, indicated that the combination of non-divergent big toe and flat flexible foot constituted a stable adaptation in these extinct species for millions of years. A giant bipedal ape with relatively small brain, flat face, deep jaws, non-projecting canines, non-divergent hallux, flat flexible foot, as embodied by sasquatch was to be sure inconceivable to the anthropological community fifty years ago. At that time, not only would its very existence violate the prevailing paradigm of the Single Species Hypothesis, which allowed for only one hominin species at a time, but the combination of features unwittingly attributed to sasquatch were quite at odds with many assumptions about the pattern of hominin evolution and supposed correlations between morphology and behavior. It should be impressive that decades later these “inconceivable” combinations of traits are now aligned with conventional wisdom, rather than at odds with it. However old paradigms can cast long shadows and many are slow to acknowledge these compelling observations. Naturally, it will require a type specimen to establish conclusively the existence of sasquatch, but the plausibility of a North American relict hominoid is quite compellingly framed theoretically according to current anthropological thinking, and a probable case for the species is made by a variety of evidence quite deserving of objective consideration. Jeff Meldrum is an anthropologist with a focus on primate foot morphology and locomotion. He developed an early interest in the sasquatch phenomenon and is one of very few scientists to approach this subject in an open-minded yet critical manner.